INSPECTION: Morning of sale from 8:00am to 10:30 am. Amada VELA II mdl. VELA 305050 30 Ton 44-Station CNC Turret Punch Press s/n AV550043 w/ Amada-Fanuc-P System 6M Controls, 44-Station Turret, (2) Indexable Tool Stations, Repositioner, Tool Extractor, 50” x 100” Ball Top Table. Amada VELA II mdl. VELA II 305050 30 Ton 44-Station CNC Turret Punch Press s/n VII 55543 w/ Amada-Fanuc-P System 6M Controls, 44-Station Turret, (2) Indexable Tool Stations, Repositioner, Tool Extractor, 50” x 100” Ball Top Table.Amada PEGA-344Q 30 Ton 56-Station CNC Turret Punch Press s/n AH440152 w/ Amada-Fanuc-P System 6M Controls, 56-Station Queen Turret, Ball Top Table, Repositioner. Flow Phaser-3 CNC Water Jet Contour Cutting Machine w/ Flow Computer Controls, M-310 (7X) 55,000 PSI ESL Intensifier, 48” x 144” Table Area, Garnet Tank. Lincoln PowerMIG 300 MIG Welding Power Source s/n U1010825461. Miller CP-300 CP-DC Arc Welding Power Source s/n JE818872 w/ Miller S-52A Wire Feeder. Miller Millermatic 200 CP-DC Arc Welding Power Source and Wire Feeder s/n JE745240. Miller Syncrowave 200 Arc Welding Power Source s/n LJ310070L w/ Miller Cooler. Miller Dialarc HF CC-AC/DC Arc Welding Power Source s/n JD662119 w/ ITW Cooler. Janda Type R140-24R 40 kVA Spot Welder s/n R1665 w/ Janda 105 Controls, 24” Throat. Janda Type R140-24 40 kVA Spot Welder s/n R1673 w/ Janda 105 Controls, 24” Throat. 40” x 85” Welding Table. Amada CSW-220 8 5/8” x 8 5/8” Power Notcher / 2” x 4” Coping Notcher Combo s/n 561426. 6’ Power Roll w/ 3 ½” Rolls. Trinco mdl. 1 24” x 24” Dry Blast Cabinet. 36” Hand Roll w/ 2” Rolls.12” Hand Roll w/ 2” Rolls. Acorn 60” x 95” Fabrication Table. Elox-Fanuc Series P CNC Wire EDM Machine w/ Fanuc Controls, 11 ½” x 16” Work Area, 17 ¾” x 20 ¼” Table Area, Hitachi Water Chiller, Filtration System. Haeger HP6-B 6 Ton Hardware Insertion Press s/n 465 w/ 18” Throat, Haeger AF-A Bowl Feeder s/n AF-097, Tooling. Haeger HP6-B 6 Ton Hardware Insertion Press s/n 554 w/ 18” Throat, Tooling. Haeger HP6-B 6 Ton Hardware Insertion Press w/ 18” Throat, Tooling. Dahlih MCV-40 CNC Vertical Machining Center s/n 4000344 w/ Fanuc System 6M Controls, 25-Station ATC, 40-Taper Spindle, 15 ¾” x 50” Table. Acer / Machinists Unipower Vertical Mill w/ 3Hp Motor, 60-4500 Dial RPM, 10” x 48” Table. Bridgeport Vertical Mill s/n 203822 w/ 60-4200 Dial Change RPM, 9” x 42” Table. Bridgeport Vertical Mill s/n 154315 w/ 60-4200 Dial Change RPM, 9” x 42” Table. LeBlond Makino Regal Shift 15” x 34” Lathe s/n 14C-336 w/ Acu-Rite DRO, 45-1800 RPM, Inch/mm Threading, Taper Attachment, Tailstock, Aloris Tool Post, 8” 3-Jaw Chuck. Amada RG-80 80 Ton x 96” CNC Press Brake s/n 803632 w/ DRC Dynabend 3 Controls, 94” Table Length, 98.5” Max Bend Length, 15.74” Throat, 3.94” Stroke, 11.8” Open Height. Amada RG-50 50 Ton x 80” CNC Press Brake s/n 504134 w/ Dynabend 3 Controls, 78.8” Table Length, 82.1” Max Bend Length, 59.9” Between Uprights, 15.76” Throat, 3.94” Stroke, 13.79” Open Height. Amada RG-25 25 Ton x 28” CNC Press Brake w/ Hurco Autobend IV Controls, 47” Table Length, 48” Max Bend Length, 8 1/8” Throat, 40 ¼” Between Uprights. DiAcro No. 1472 72” Hydra Power Press Brake s/n JG-1197 w/ 72” Base, 9 ¼” Throat, Manual Back Gage, 62” Between Uprights. DiAcro mdl. 14-48-2 48” Hydra Power Press Brake s/n 6820979543 w/ Manual Back Gage, 6 ¼” Throat. Kalamazoo mdl. VS-36 36” Vertical Band Saw s/n 070 w/ Blade Welder, Digital Speed Indicator, Pneumatic Feed Table. Doringer mdl. D350 Miter Cold Saw w/ Abrasive Saw and Conveyor. Kalamazoo mdl. K10 10” Abrasive Miter Cutoff Saw. Timesavers mdl. 137-1HDM 36” Belt Grainer s/n 11460 w/ Dust Collector. Abrasive No. M3 8” x 24” Automatic Surface Grinder s/n M3-362 w/Magnetic Chuck. Harig 6” x 12” Surface Grinder w/ Magnetic Chuck. 6” Stroke Sander w/ 24” x 78” Table. Custom Built Powder Paint Booth w/ (2) Paint Stations, 12’ x 5’4” x 8’H. Custom Built Conveyorized Drying Oven w/ (36) Gas Fired Infrared Reactors, 1,500,000 BTU.2-Stage Wash system w/ Tanks, Pumps, Blowers and Controls. 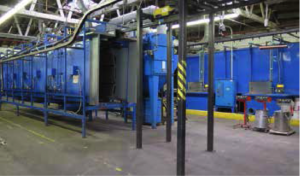 8’ x 12’ x 8’ Gas Fired Curing Oven w/ Digital Temp Controls, Exhaust and Circulating Fans. (2) Farr mdl. 2-FD45-24 Cyclone Style Dust Collectors. Farr 8-Cartridge Dust Collection System. 10’ x 20’ Paint Booth w/ Fans. Chase Ind. mdl. 5496MB-9 36kW Pass Thru Drying Oven s/nT0704. Iontech GX7000S Powder Paint System w/ Parker Ionics GX355A Controls, GX121 Powder Paint Gun. (3) Iontech Powder Paint Spray Systems. 1994 International 4700 T444E 22’ Stake Bed Truck Lisc# 8G20837 w/ Diesel Engine, 6+ PLUS Manual Trans, 262,844 Miles, VIN# 1HTSCABM2SH611158. 1995 Ford F-Super Duty 12’ Box Truck Lisc# 5F77114 w/ 7.5L V-8 Gas Engine, 5-Speed Manual Trans, Dual Gas Tanks, 243,725 Miles, VIN# 1FDLF47G7TEA33313.